(NEW YORK) — A wet pattern is taking shape across the eastern U.S. again. Numerous to widespread thunderstorms are expected as a frontal system from the west approaches and stalls over the region. There have already been flash flood warnings on Wednesday morning for parts of Virginia, including the Charlottesville area. Radar estimated that 3 to 6 inches of rain have fallen in parts of interior Virginia, causing flooding. Some roads were reported to be closed in Charlottesville overnight due to the flooding. Strong storms overnight also caused some damage and flooding along the Ohio and Michigan border and in the Detroit metro area. Flash flood watches have now been posted from Western Florida to Central Pennsylvania. Rainfall rates of 2 inches per hour are possible in thunderstorms, which could produce flash flooding. 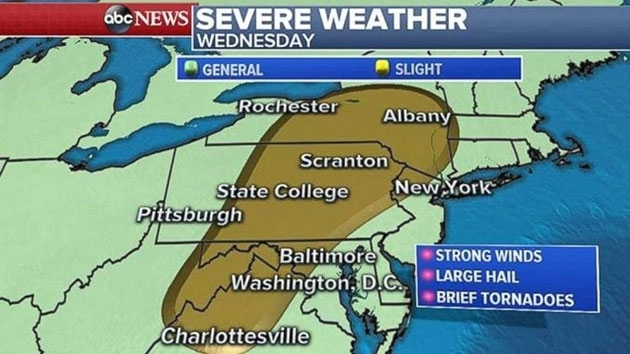 A slight risk for severe weather exists Wednesday for more than 14 million Americans from Virginia to New York. Scattered severe storms will bring the possibility of damaging winds, large hail and brief tornadoes. The best chance for brief tornadoes will be just west of Interstate 95. Rainfall totals by the end of this week could exceed 4 inches across parts of northern Georgia, western North Carolina and South Carolina. Widespread rainfall totals of 2 to 4 inches are possible from Florida to Vermont. This wet pattern for the first few days of August comes after a record-breaking July across the east. Baltimore; Cape Hatteras, North Carolina; Elmira, New York; Harrisburg, Pennsylvania; Mount Pocono, Pennsylvania; State College, Pennsylvania; Washington, D.C.; and Williamsport, Pennsylvania, all saw their wettest July on record. There are more than 63 uncontained large wildfires burning in 14 states across the western U.S. from Texas to Alaska. Since July is now over, several observing locations in Southern California recorded their warmest July on record, including Palmdale and Long Beach. Burbank and Los Angeles Airport recorded their second warmest July on record. Fresno recorded its 26th day of temperatures over 100 degrees, extending their ongoing record. Another hot day is ahead for much of the West with triple-digit temperatures likely for much of interior California and into parts of eastern Oregon and Washington. For parts of California, including Redding, it is seasonable to have temperatures near 100 degrees in early July. New fire weather alerts have been posted for parts of the Northwest. A frontal system approaching from the west will kick winds up. The gusty winds and combined hot and dry conditions could ignite new fires and worsen existing ones.